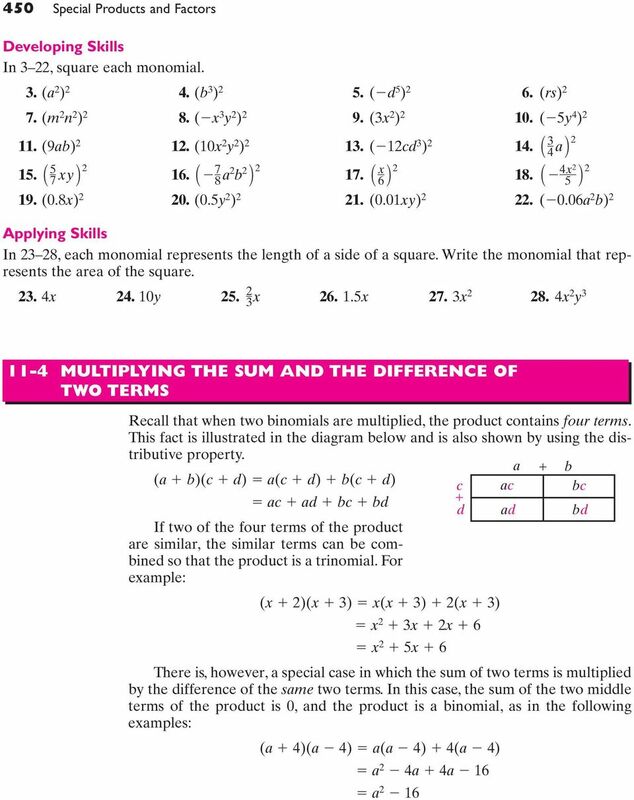 Download "SPECIAL PRODUCTS AND FACTORS"
1 CHAPTER CHAPTER TABLE OF CONTENTS 11-1 Factors and Factoring 11-2 Common Monomial Factors 11-3 The Square of a Monomial 11-4 Multiplying the Sum and the Difference of Two Terms 11-5 Factoring the Difference of Two Perfect Squares 11-6 Multiplying Binomials 11-7 Factoring Trinomials 11-8 Factoring a Polynomial Completely Chapter Summary Vocabulary Review Exercises Cumulative Review SPECIAL PRODUCTS AND FACTORS The owners of a fruit farm intend to extend their orchards by planting 100 new apple trees.the trees are to be planted in rows, with the same number of trees in each row. In order to decide how the trees are to be planted, the owners will use whole numbers that are factors of 100 to determine the possible arrangements: 1 row of 100 trees 20 rows of 5 trees each 2 rows of 50 trees each 25 rows of 4 trees each 4 rows of 25 trees each 50 rows of 2 trees each 5 rows of 20 trees each 100 rows of 1 tree each 10 rows of 10 trees each From this list of possibilities, the arrangement that best fits the dimensions of the land to be planted can be chosen. If the owner had intended to plant 90 trees, how many possible arrangements would there be? From earliest times, the study of factors and prime numbers has fascinated mathematicians, leading to the discovery of many important principles. In this chapter you will extend your knowledge of the factors of whole numbers, study the products of special binomials, and learn to write polynomials in factored form. 2 Factors and Factoring FACTORS AND FACTORING When two numbers are multiplied, the result is called their product. The numbers that are multiplied are factors of the product. Since 3(5) 15, the numbers 3 and 5 are factors of 15. Factoring a number is the process of finding those numbers whose product is the given number. Usually, when we factor, we are finding the factors of an integer and we find only those factors that are integers. We call this factoring over the set of integers. Factors of a product can be found by using division. Over the set of integers, if the divisor and the quotient are both integers, then they are factors of the dividend. For example, Thus, 35 5(7), and 5 and 7 are factors of 35. Every positive integer that is the product of two positive integers is also the product of the opposites of those integers. 21 ( 3)( 7) 21 ( 3)( 7) Every negative integer that is the product of a positive integer and a negative integer is also the product of the opposites of those integers. 21 ( 3)( 7) 21 ( 3)( 7) Usually, when we factor a positive integer, we write only the positive integral factors. Two factors of any number are 1 and the number itself. To find other integral factors, if they exist, we use division, as stated above. We let the number being factored be the dividend, and we divide this number in turn by the whole numbers 2, 3, 4, and so on. If the quotient is an integer, then both the divisor and the quotient are factors of the dividend. For example, use a calculator to find the integral factors of 126. We will use integers as divisors and look for quotients that are integers. Pairs of factors of 126 are listed to the right of the quotients. 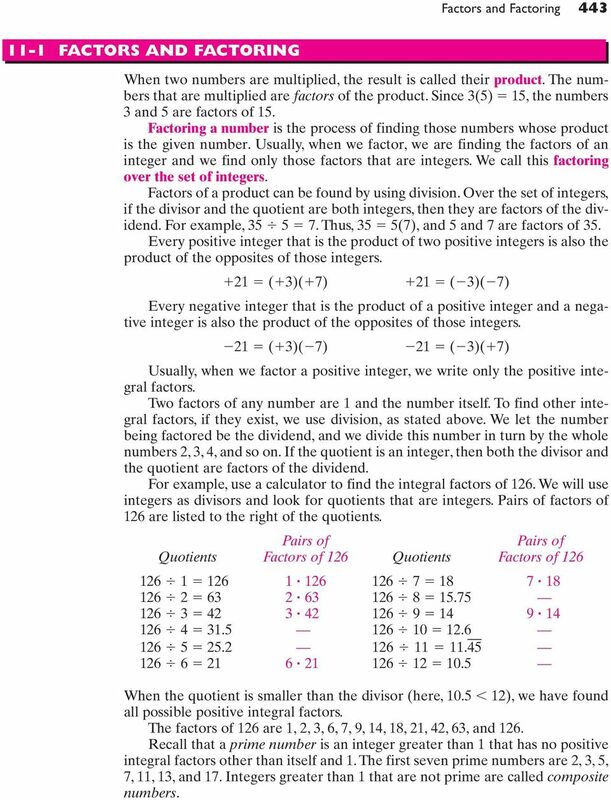 Pairs of Pairs of Quotients Factors of 126 Quotients Factors of When the quotient is smaller than the divisor (here, ), we have found all possible positive integral factors. The factors of 126 are 1, 2, 3, 6, 7, 9, 14, 18, 21, 42, 63, and 126. Recall that a prime number is an integer greater than 1 that has no positive integral factors other than itself and 1. The first seven prime numbers are 2, 3, 5, 7, 11, 13, and 17. Integers greater than 1 that are not prime are called composite numbers. 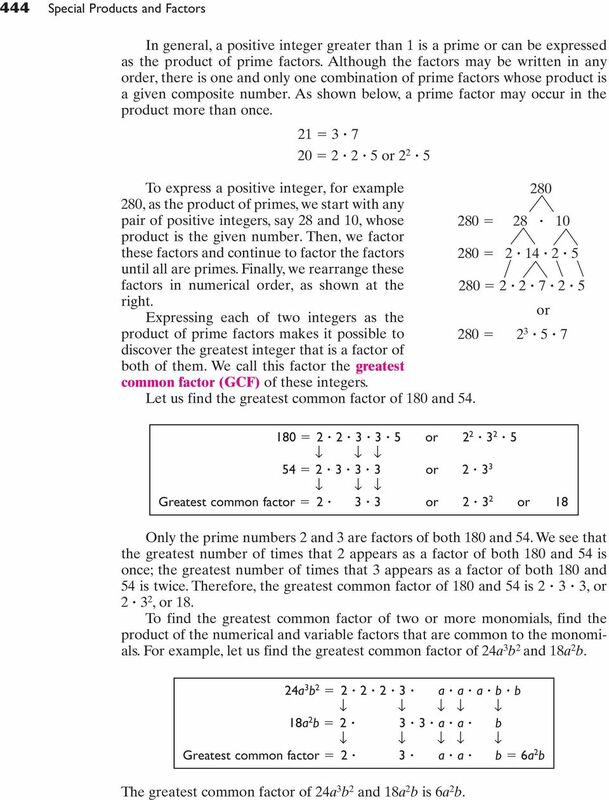 3 444 Special Products and Factors In general, a positive integer greater than 1 is a prime or can be expressed as the product of prime factors. Although the factors may be written in any order, there is one and only one combination of prime factors whose product is a given composite number. As shown below, a prime factor may occur in the product more than once or To express a positive integer, for example , as the product of primes, we start with any pair of positive integers, say 28 and 10, whose product is the given number. Then, we factor these factors and continue to factor the factors until all are primes. Finally, we rearrange these factors in numerical order, as shown at the right. Expressing each of two integers as the or product of prime factors makes it possible to discover the greatest integer that is a factor of both of them. We call this factor the greatest common factor (GCF) of these integers Let us find the greatest common factor of 180 and or or Greatest common factor or or 18 Only the prime numbers 2 and 3 are factors of both 180 and 54. We see that the greatest number of times that 2 appears as a factor of both 180 and 54 is once; the greatest number of times that 3 appears as a factor of both 180 and 54 is twice. Therefore, the greatest common factor of 180 and 54 is 2 3 3, or 2 3 2, or 18. 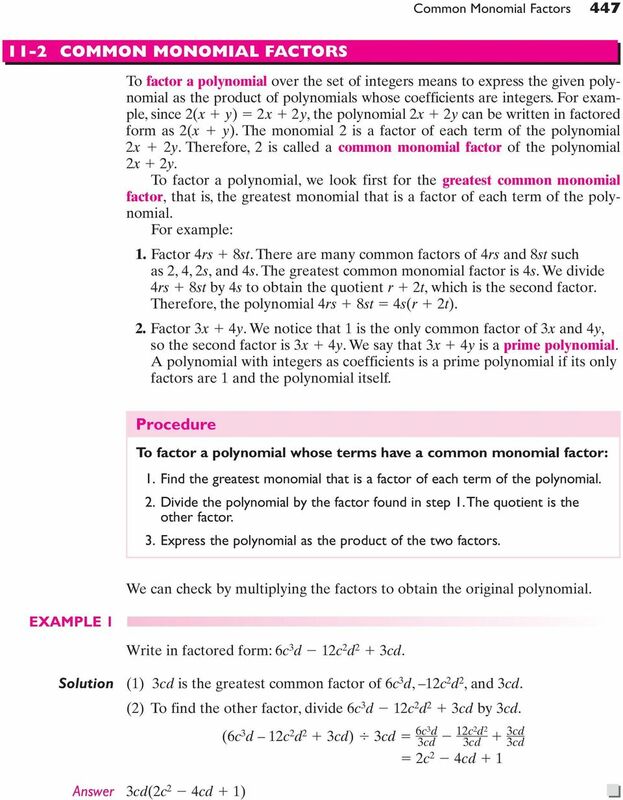 To find the greatest common factor of two or more monomials, find the product of the numerical and variable factors that are common to the monomials. For example, let us find the greatest common factor of 24a 3 b 2 and 18a 2 b. 24a 3 b a a a b b 18a 2 b a a b Greatest common factor 2 3 a a b 6a 2 b The greatest common factor of 24a 3 b 2 and 18a 2 b is 6a 2 b. 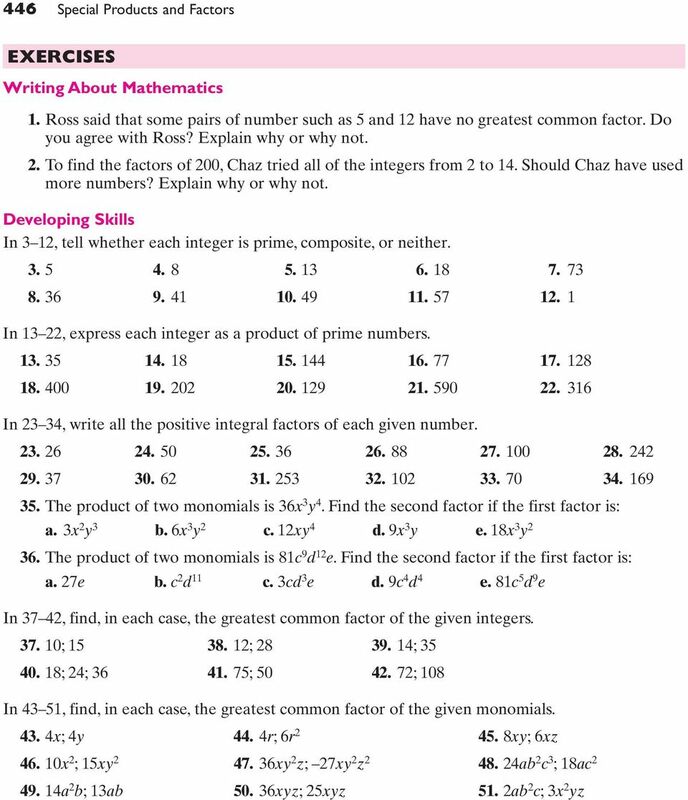 7 448 Special Products and Factors EXERCISES Writing About Mathematics 1. Ramón said that the factored form of 3a 6a 2 15a 3 is 3a(2a 5a 2 ). Do you agree with Ramón? Explain why or why not. 2. a. The binomial 12a 2 20ab can be written as 4a(3a 5b). Does that mean that for all positive integral values of a and b, the value of 12a 2 20ab has at least two factors other than itself and 1? Justify your answer. b. The binomial 3a 5b is a prime polynomial. Does that mean that for all positive integral values of a and b,3a 5b is a prime number? Justify your answer. Developing Skills In 3 29, write each expression in factored form. 3. 2a 2b 4. 3x 3y 5. bx by 6. xc xd 7. 4x 8y 8. 3m 6n 9. 12x 18y c 27d 11. 8x y c 14. y 2 3y 15. 2x 2 5x 16. ax 5ab 17. 3y 4 3y x 15x x 4x p prt 21. pr 2 prl 22. pr 2 2prh 23. 3a y 2 4y 25. 3ab 2 6a 2 b r 3 s 2 14r 2 s 27. 3x 2 6x c 3 c 2 2c 29. 9ab 2 6ab 3a Applying Skills 30. The perimeter of a rectangle is represented by 2l 2w. 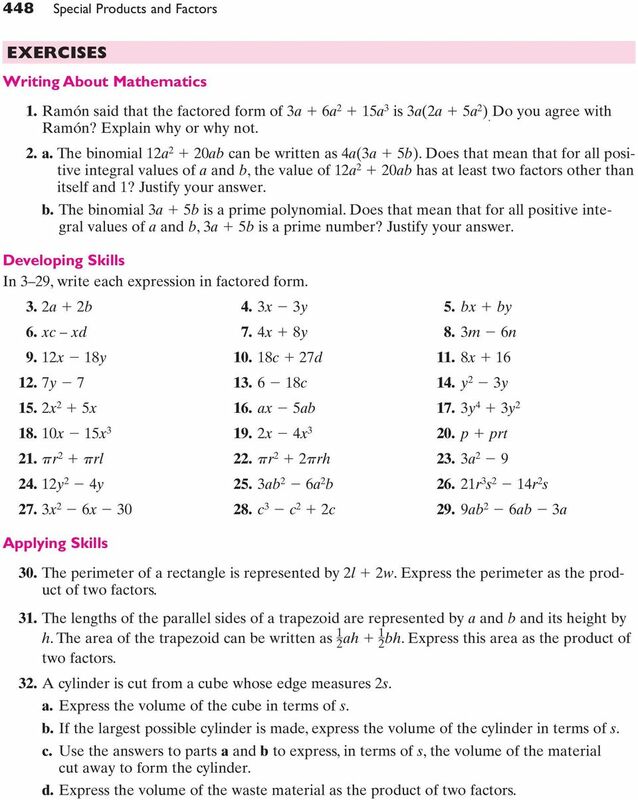 Express the perimeter as the product of two factors. 31. The lengths of the parallel sides of a trapezoid are represented by a and b and its height by 1 h. The area of the trapezoid can be written as 2 ah bh. Express this area as the product of two factors. 32. A cylinder is cut from a cube whose edge measures 2s. a. Express the volume of the cube in terms of s. b. If the largest possible cylinder is made, express the volume of the cylinder in terms of s. c. Use the answers to parts a and b to express, in terms of s, the volume of the material cut away to form the cylinder. d. Express the volume of the waste material as the product of two factors. 8 The Square of a Monomial THE SQUARE OF A MONOMIAL To square a monomial means to multiply the monomial by itself. For example: (3x) 2 (3x)(3x) (3)(3)(x)(x) (3) 2 (x) 2 or 9x 2 (5y 2 ) 2 (5y 2 )(5y 2 ) (5)(5)(y 2 )(y 2 ) (5) 2 (y 2 ) 2 or 25y 4 ( 6b 4 ) 2 ( 6b 4 )( 6b 4 ) ( 6)( 6)(b 4 )(b 4 ) ( 6) 2 ( b 4 ) 2 or 36b 8 (4c 2 d 3 ) 2 (4c 2 d 3 )(4c 2 d 3 ) (4)(4)(c 2 )(c 2 )(d 3 )(d 3 ) (4) 2 (c 2 ) 2 (d 3 ) 2 or 16c 4 d 6 When a monomial is a perfect square, its numerical coefficient is a perfect square and the exponent of each variable is an even number. This statement holds true for each of the results shown above. Procedure To square a monomial: 1. Find the square of the numerical coefficient. 2. 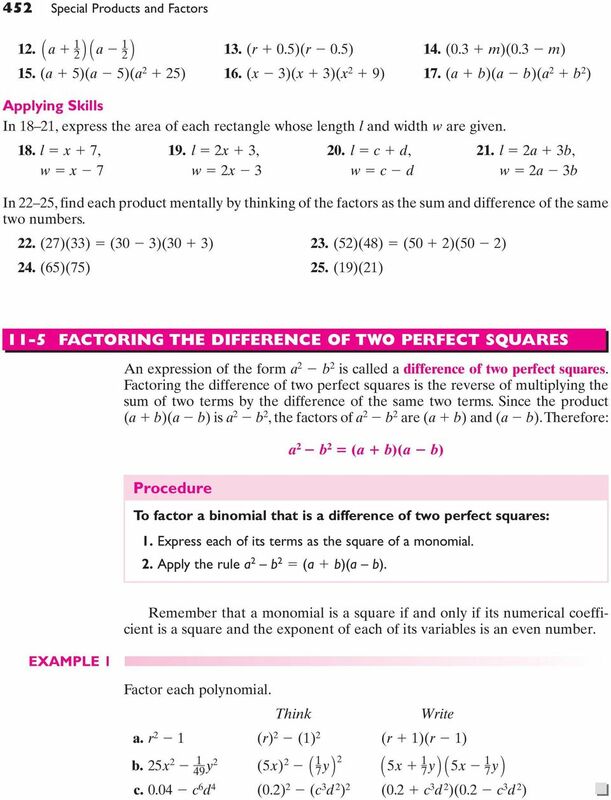 Find the square of each literal factor by multiplying its exponent by The square of the monomial is the product of the expressions found in steps 1 and 2. 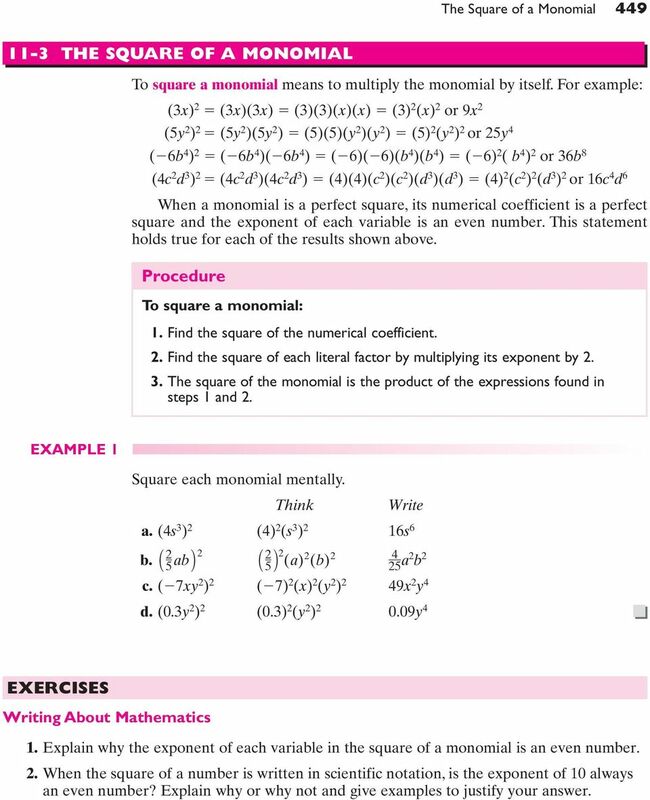 EXAMPLE 1 Square each monomial mentally. Think Write a. (4s 3 ) 2 (4) 2 (s 3 ) 2 16s 6 b. A 2 5 ab B 2 A 2 5 B 2 (a) 2 (b) a2 b 2 c. ( 7xy 2 ) 2 ( 7) 2 (x) 2 (y 2 ) 2 49x 2 y 4 d. (0.3y 2 ) 2 (0.3) 2 (y 2 ) y 4 EXERCISES Writing About Mathematics 1. Explain why the exponent of each variable in the square of a monomial is an even number. 2. When the square of a number is written in scientific notation, is the exponent of 10 always an even number? Explain why or why not and give examples to justify your answer. 14 Multiplying Binomials 455 Procedure To find the product of two binomials (ax b) and (cx d) where a, b, c, and d have numerical values: 1. 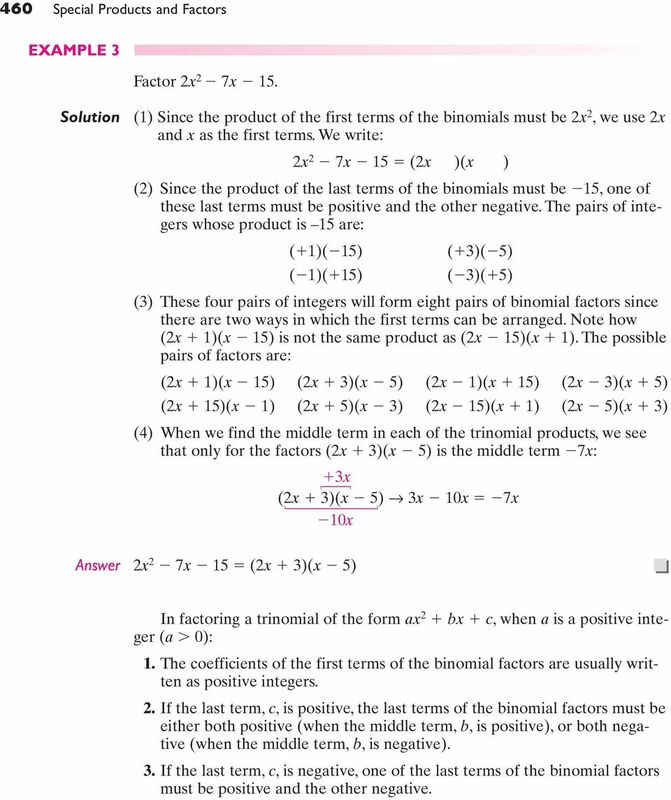 Multiply the first terms of the binomials. 2. Multiply the first term of each binomial by the last term of the other binomial (the outer and inner terms), and add these products. 3. Multiply the last terms of the binomials. 4. Write the results of steps 1, 2, and 3 as a sum. EXAMPLE 1 Write the product (x 5)(x 7) as a trinomial. Solution 1. (x)(x) x 2 (x 5)(x 7) 2. (x)( 7) ( 5)(x) ( 7x) ( 5x) 12x 3. ( 5)( 7) x 2 12x 35 Answer EXAMPLE 2 Write the product (3y 8)(4y 3) as a trinomial. Solution 1. (3y)(4y) 12y 2 (3y 8)(4y 3) 2. (3y)(3) ( 8)(4y) 9y ( 32y) 23y 3. 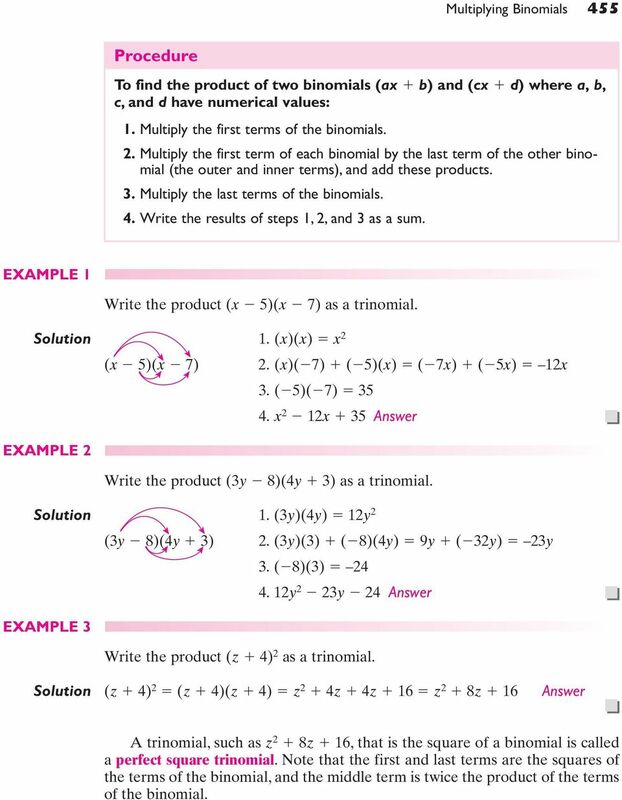 ( 8)(3) y 2 23y 24 Answer EXAMPLE 3 Write the product (z 4) 2 as a trinomial. Solution (z 4) 2 (z 4)(z 4) z 2 4z 4z 16 z 2 8z 16 Answer A trinomial, such as z 2 8z 16, that is the square of a binomial is called a perfect square trinomial. 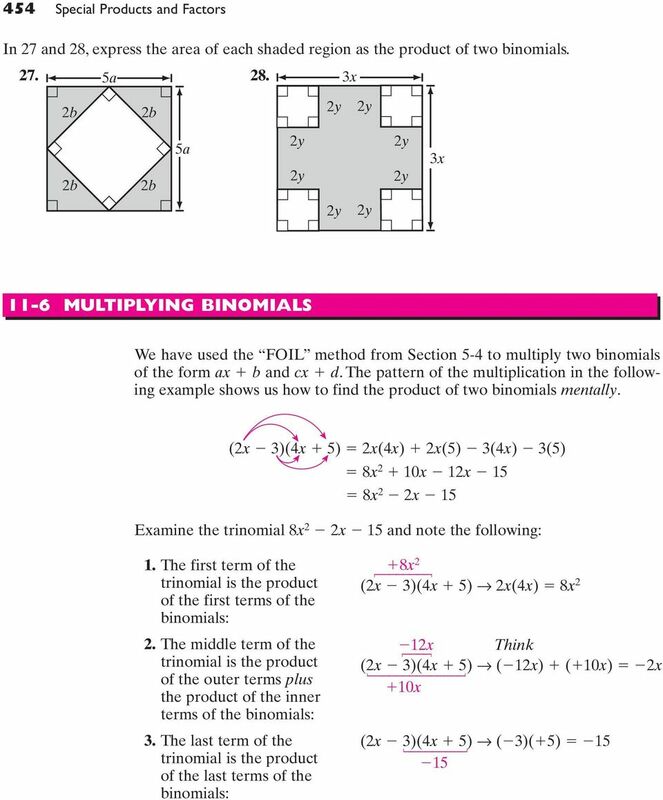 Note that the first and last terms are the squares of the terms of the binomial, and the middle term is twice the product of the terms of the binomial. 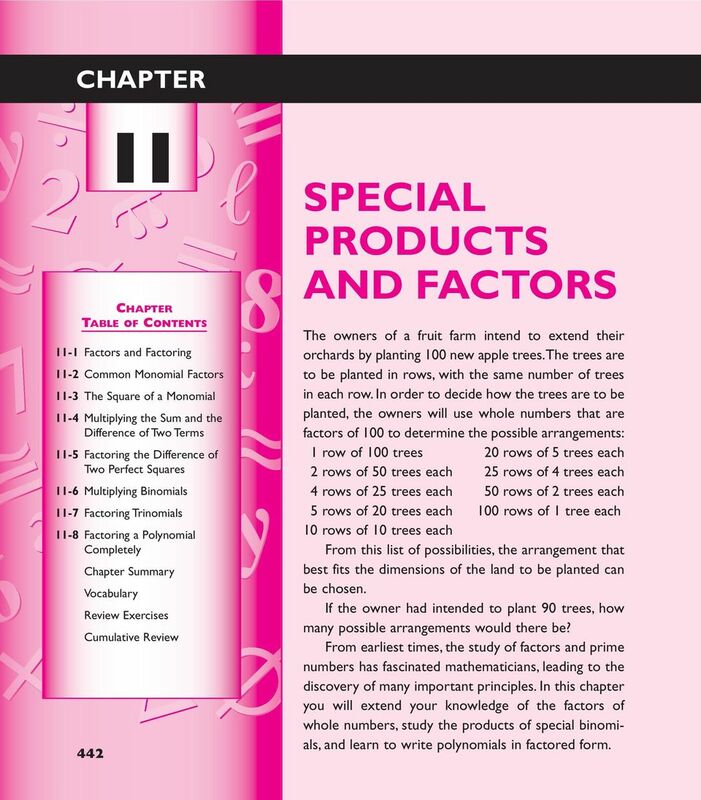 15 456 Special Products and Factors EXERCISES Writing About Mathematics 1. 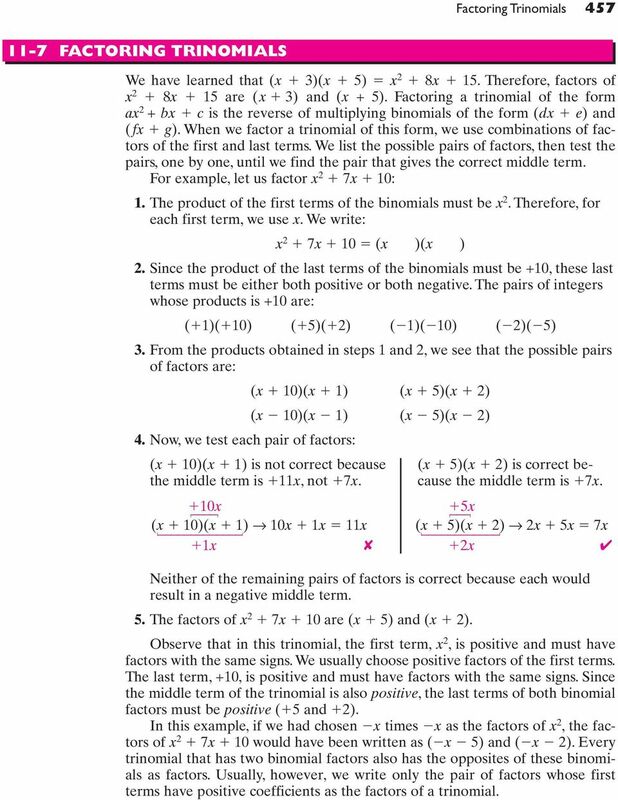 What is a shorter procedure for finding the product of binomials of the form (ax b) and (ax b)? 2. Which part of the procedure for multiplying two binomials of the form (ax b) and (cx d) does not apply to the product of binomials such as (3x 5) and (2y 7)? Explain your answer. Developing Skills In 3 29, perform each indicated operation mentally. 3. (x 5)(x 3) 4. (6 d)(3 d) 5. (x 10)(x 5) 6. (8 c)(3 c) 7. (x 7)(x 2) 8. (n 20)(n 3) 9. (5 t)(9 t) 10. (3x 2)(x 5) 11. (c 5)(3c 1) 12. (y 8) (a 4) (2x 1) (3x 2) (7x 3)(2x 1) 17. (2y 3)(3y 2) 18. (3x 4) (2x 5) (3t 2)(4t 7) 21. (5y 4)(5y 4) 22. (2t 3)(5t 1) 23. (2a b)(2a 3b) 24. (5x 7y)(3x 4y) 25. (2c 3d)(5c 2d) 26. (a b) (a b)(2a 3) 28. (6t 1)(4t z) 29. (9y w)(9y 3w) Applying Skills 30. Write the trinomial that represents the area of a rectangle whose length and width are: a. (x 5) and (x 4) b. (2x 3) and (x 1) 31. Write the perfect square trinomial that represents the area of a square whose sides are: a. (x 6) b. (x 2) c. (2x 1) d. (3x 2) 32. The length of a garden is 3 feet longer than twice the width. a. If the width of the garden is represented by x, represent the length of the garden in terms of x. b. If the width of the garden is increased by 5 feet, represent the new width in terms of x. c. If the length of the enlarged garden is also increased so that it is 3 feet longer than twice the new width, represent the length of the enlarged garden in terms of x. d. Express the area of the enlarged garden in terms of x. 16 Factoring Trinomials FACTORING TRINOMIALS We have learned that (x 3)(x 5) x 2 8x 15. Therefore, factors of x 2 8x 15 are (x 1 3) and (x + 5). Factoring a trinomial of the form ax 2 + bx c is the reverse of multiplying binomials of the form (dx e) and (fx g). When we factor a trinomial of this form, we use combinations of factors of the first and last terms. We list the possible pairs of factors, then test the pairs, one by one, until we find the pair that gives the correct middle term. For example, let us factor x 2 7x 10: 1. The product of the first terms of the binomials must be x 2. Therefore, for each first term, we use x. We write: x 2 7x 10 (x )(x ) 2. Since the product of the last terms of the binomials must be +10, these last terms must be either both positive or both negative. The pairs of integers whose products is +10 are: ( 1)( 10) ( 5)( 2) ( 1)( 10) ( 2)( 5) 3. From the products obtained in steps 1 and 2, we see that the possible pairs of factors are: (x 10)(x 1) (x 5)(x 2) (x 10)(x 1) (x 5)(x 2) 4. Now, we test each pair of factors: (x 10)(x 1) is not correct because (x 5)(x 2) is correct bethe middle term is 11x, not 7x. cause the middle term is 7x. 10x (x 10)(x 1) 10x 1x 11x 1x 5x (x 5)(x 2) 2x 5x 7x 2x Neither of the remaining pairs of factors is correct because each would result in a negative middle term. 5. The factors of x 2 7x 10 are (x 5) and (x 2). Observe that in this trinomial, the first term, x 2, is positive and must have factors with the same signs. We usually choose positive factors of the first terms. The last term, +10, is positive and must have factors with the same signs. Since the middle term of the trinomial is also positive, the last terms of both binomial factors must be positive ( 5 and 2). In this example, if we had chosen x times x as the factors of x 2, the factors of x 2 7x 10 would have been written as ( x 5) and ( x 2). Every trinomial that has two binomial factors also has the opposites of these binomials as factors. Usually, however, we write only the pair of factors whose first terms have positive coefficients as the factors of a trinomial. 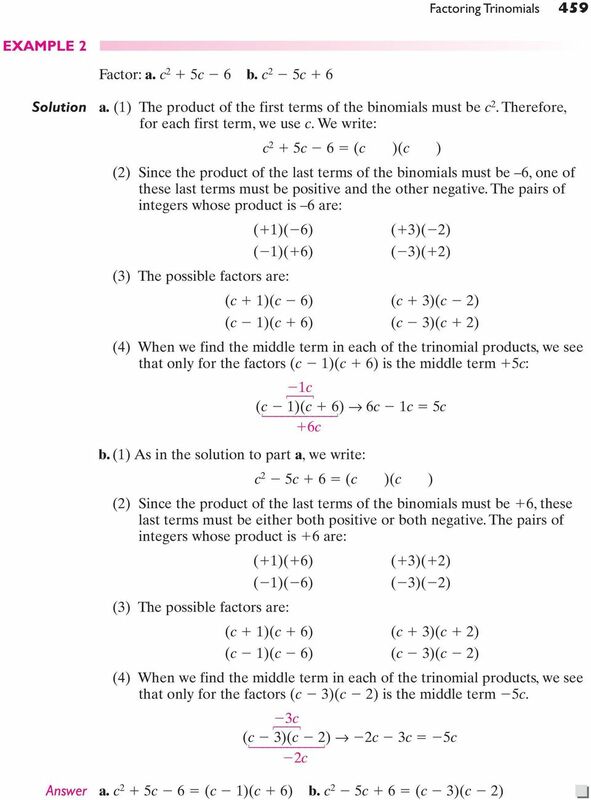 17 458 Special Products and Factors Procedure To factor a trinomial of the form ax 2 bx c, find two binomials that have the following characteristics: 1. The product of the first terms of the binomials is equal to the first term of the trinomial (ax 2 ). 2. The product of the last terms of the binomials is equal to the last term of the trinomial (c). 3. When the first term of each binomial is multiplied by the last term of the other binomial and the sum of these products is found, the result is equal to the middle term of the trinomial. EXAMPLE 1 Factor y 2 8y 12. 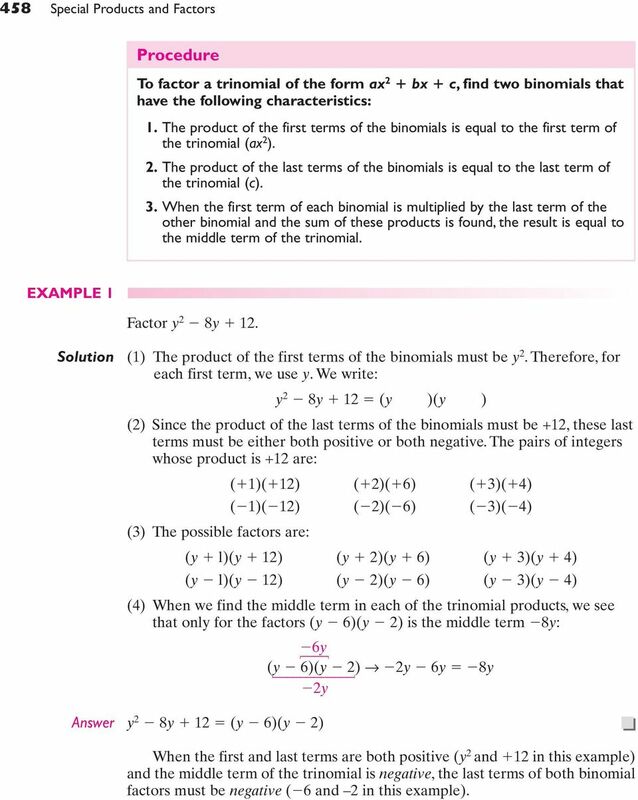 Solution (1) The product of the first terms of the binomials must be y 2. Therefore, for each first term, we use y. We write: y 2 8y 12 (y )(y ) (2) Since the product of the last terms of the binomials must be +12, these last terms must be either both positive or both negative. The pairs of integers whose product is +12 are: ( 1)( 12) ( 2)( 6) ( 3)( 4) ( 1)( 12) ( 2)( 6) ( 3)( 4) (3) The possible factors are: (y l)(y 12) (y 2)(y 6) (y 3)(y 4) (y l)(y 12) (y 2)(y 6) (y 3)(y 4) (4) When we find the middle term in each of the trinomial products, we see that only for the factors (y 6)(y 2) is the middle term 8y: 6y (y 6)(y 2) 2y 6y 8y 2y Answer y 2 8y 12 (y 6)(y 2) When the first and last terms are both positive (y 2 and 12 in this example) and the middle term of the trinomial is negative, the last terms of both binomial factors must be negative ( 6 and 2 in this example). 19 460 Special Products and Factors EXAMPLE 3 Factor 2x 2 7x 15. 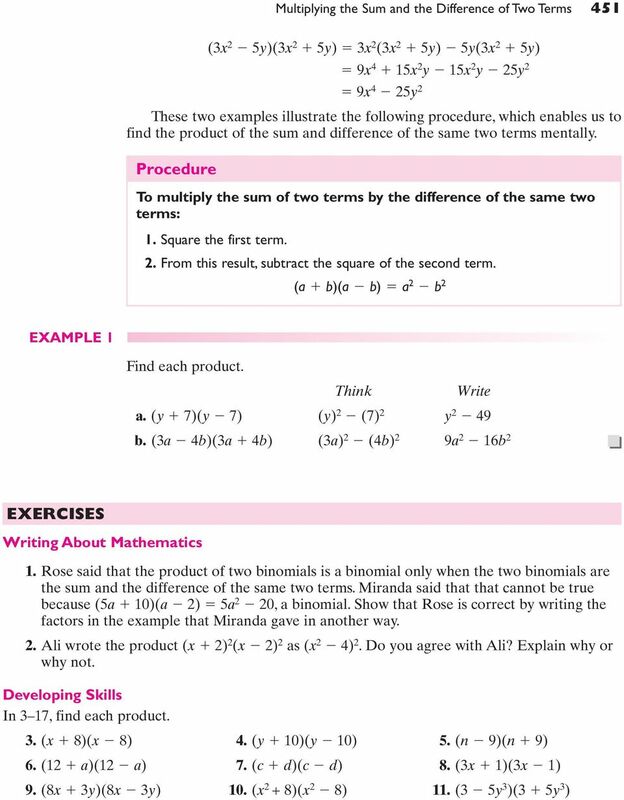 Solution (1) Since the product of the first terms of the binomials must be 2x 2, we use 2x and x as the first terms. We write: 2x 2 7x 15 (2x )(x ) (2) Since the product of the last terms of the binomials must be 15, one of these last terms must be positive and the other negative. The pairs of integers whose product is 15 are: ( 1)( 15) ( 3)( 5) ( 1)( 15) ( 3)( 5) (3) These four pairs of integers will form eight pairs of binomial factors since there are two ways in which the first terms can be arranged. Note how (2x 1)(x 15) is not the same product as (2x 15)(x 1). The possible pairs of factors are: (2x 1)(x 15) (2x 3)(x 5) (2x 1)(x 15) (2x 3)(x 5) (2x 15)(x 1) (2x 5)(x 3) (2x 15)(x 1) (2x 5)(x 3) (4) When we find the middle term in each of the trinomial products, we see that only for the factors (2x 3)(x 5) is the middle term 7x: 3x (2x 3)(x 5) 3x 10x 7x 10x Answer 2x 2 7x 15 (2x 3)(x 5) In factoring a trinomial of the form ax 2 bx c, when a is a positive integer (a 0): 1. The coefficients of the first terms of the binomial factors are usually written as positive integers. 2. If the last term, c, is positive, the last terms of the binomial factors must be either both positive (when the middle term, b, is positive), or both negative (when the middle term, b, is negative). 3. If the last term, c, is negative, one of the last terms of the binomial factors must be positive and the other negative. 20 Factoring a Polynomial Completely 461 EXERCISES Writing About Mathematics 1. Alicia said that the factors of x 2 bx c are (x d)(x e) if c de and b d e.do you agree with Alicia? Explain why or why not. 2. Explain why there is no positive integral value of c for which x 2 x c has two binomial factors. Developing Skills In 3 33, factor each trinomial. 3. a 2 3a 2 4. c 2 6c 5 5. x 2 8x 7 6. x 2 11x y 2 6y 8 8. y 2 6y 8 9. y 2 9y y 2 9y y 2 2y y 2 2y y 2 7y y 2 7y x 2 11x a 2 11a z 2 10z x 2 5x x 2 10x x 2 x x 2 6x y 2 4y c 2 2c x 2 7x z 2 9z x 2 5x x 2 10x x 2 8x x 2 x x 2 12x a 2 9a a 2 7ab 2b x 2 5xy 6y 2 Applying Skills In 34 36, each trinomial represents the area of a rectangle. In each case, find two binomials that could be expressions for the dimensions of the rectangle. 34. x 2 10x x 2 9x x 2 14x 15 In 37 39, each trinomial represents the area of a square. In each case, find a binomial that could be an expression for the measure of each side of the square. 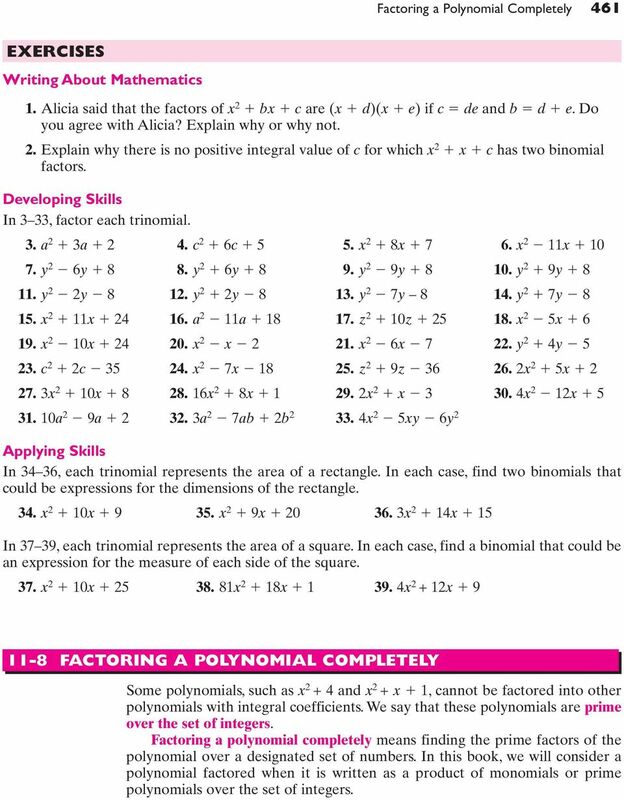 37. x 2 10x x 2 18x x x FACTORING A POLYNOMIAL COMPLETELY Some polynomials, such as x and x 2 + x 1, cannot be factored into other polynomials with integral coefficients. We say that these polynomials are prime over the set of integers. Factoring a polynomial completely means finding the prime factors of the polynomial over a designated set of numbers. In this book, we will consider a polynomial factored when it is written as a product of monomials or prime polynomials over the set of integers. 27 468 Special Products and Factors Part III Answer all questions in this part. Each correct answer will receive 3 credits. Clearly indicate the necessary steps, including appropriate formula substitutions, diagrams, graphs, charts, etc. For all questions in this part, a correct numerical answer with no work shown will receive only 1 credit. 13. The width of Mattie s rectangular garden is 10 feet less than the length. She bought 25 yards of fencing and used all but 7 feet to enclose the garden. a. 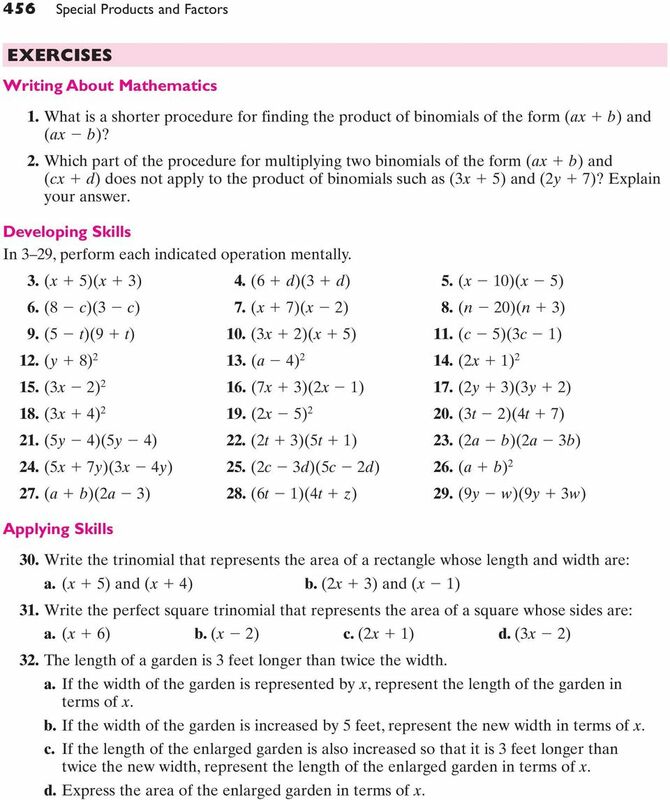 Write an equation or a system of equations that can be used to find the dimensions, in feet, of the garden. b. What are the dimensions, in feet, of the garden? 14. The population of a small town at the beginning of the year was 7,000. Records show that during the year there were 5 births, 7 deaths, 28 new people moved into town, and 12 residents moved out. What was the percent of increase or decrease in the town population? Part IV Answer all questions in this part. Each correct answer will receive 4 credits. Clearly indicate the necessary steps, including appropriate formula substitutions, diagrams, graphs, charts, etc. For all questions in this part, a correct numerical answer with no work shown will receive only 1 credit. 15. Admission to a museum is $5.00 for adults and $3.00 for children. In one day $2,400 was collected for 620 paid admissions. How many adults and how many children paid to visit the museum that day? 16. a. Write an equation of a line whose slope is 2 and whose y-intercept is 5. b. Sketch the graph of the equation written in a. c. Are ( 1, 3) the coordinates of a point on the graph of the equation written in a? d. If (k, 1) are the coordinates of a point on the graph of the equation written in a, what is the value of k? 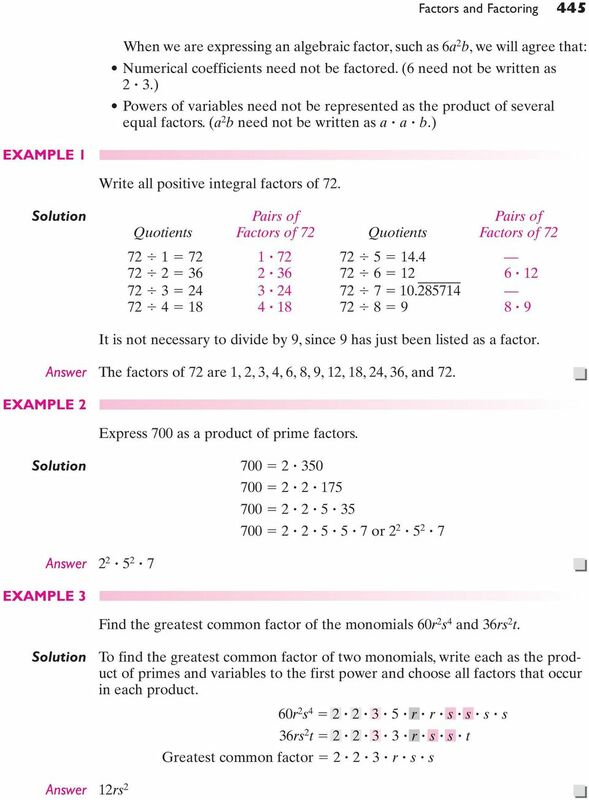 296 CHAPTER 5 Factoring and Applications 5.1 The Greatest Common Factor; Factoring by Grouping OBJECTIVES 1 Find the greatest common factor of a list of terms. 2 Factor out the greatest common factor.